I come from a very strict Indian Classical music background. However, I LOVE singing Kirtans and sharing my music, singing together, feeling the love flow. 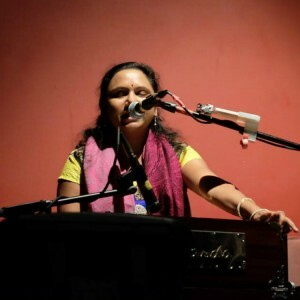 Singing Kirtans is extremely meditative, rejuvenates and relieves stress. I always believe that all good things need to be shared and sharing Kirtans with other multiplies its positive effects. I organize a Kirtan MeetUp group in Simi Valley, CA. I will be sharing my thoughts on Kirtans in this page. We all know that Meditation offers innumerable benefits for your body, mind and spirit. The rest you gain in meditation is deeper than the deepest sleep. The deeper your rest, the more dynamic your activity is. There are physical benefits of Meditation as well. Meditation has been known to lower High Blood Pressure, lowers blood lactate, thus reducing anxiety attacks and increases energy level. However, Meditation doesn’t come easy for many people. And that’s where kirtan- an ancient call and response style music helps. Kirtan music is one of the oldest scared traditions of the world that originated in India. Using ancient Sanskrit mantras, the kirtan calls upon sacred energies which serve to quiet the mind, remove obstacles, and bring us back to the center of our being. Kirtans have short “Mantras” or couplets. These mantras are repeated over and over. Typically the lead singer starts singing the Mantra slowly and builds in up to a higher tempo. By focusing on the rhythm and by singing these versus people experience freedom from stress. Often times people who participate, clap in rhythm while singing, close their eyes to concentrate and at the end of a Mantra sigh and enjoy the newly found bliss and enjoy the silence. Kirtan involves singing but it goes beyond ones singing abilities. It is not about the “Art” of singing but about “Heart” of singing. Everyone can participate, regardless of age or cultural background. The purpose of this music is to get us out of our heads and into our hearts. Typically, the songs can last for 20-30 minutes each with a few moments of silence in between each song so you can soak it all up. The longer songs allow for deeper experience of the effects, and with the simple, repetitive lyrics (it’s a chant, after all!) we really don’t have to think much about the words.People often say they feel “buzzed” for days following such a chanting experience. So what gives us that buzz? Something about the kirtan experience goes beyond the music itself, goes to a deeper experience of vibration. We all resonate at different frequencies, and these frequencies change according to what we are doing and thinking. So when we are all doing the same thing-chanting, breathing, and moving to the same rhythms-our vibrations begin to synchronize and the resulting experience is very powerful. The laws of vibration help us out here, because vibrations align themselves to stronger vibrations, so even if you’re having a truly rotten day, it may be difficult to hold onto those feelings during the chant experience. If you were only to sit in the room without participating, the idea is that you could still feel the shift. Something happens-the energy begins to activate the spirit that exists within us all. In fact, because the ancient Sanskrit lyrics are not familiar to many of us Westerners, these words take us away from the mind’s constant chatter a little easier. The powerful healing and transformational energies of these ancient chants can help to reconnect us to the Ever-Present and Eternal Being that lies within us all. All the mantras, melodies, and instruments of kirtan are designed to lead us toward this meditative state. During our Kirtan MeetUps we all sit together on floor like we do back in India. There are a few chairs for those who prefer. The atmosphere is pretty relaxed. Most of us spend the day in our heads, running here and there, thinking about where we have to be and what we have to do next. The kirtan gives us a time to come back to our center. And when this happens, beautiful things begin to unfold. Feelings of inspiration, peace, and a sense of connectedness are common experiences. All our Kirtan MeetUps are FREE and open ! Quiet Your Mind, Feel Your Self! Kirtan helps the mind become quiet, and when the mind quiets, we can begin to perceive the mystical things, the sacred experiences, that are around us always. In the silence between the songs, when the song stops, you can feel something. And that something is you. There is no greater experience than the experience of one’s Self. And that vibration is always within you, that vibration is you. That’s the beauty of any chant experience-with little or no effort we can experience and enjoy the vibrations of peace, energy, healing and inspiration that are always within us. Indian classical music, be it Hindustani (North Indian) or Carnatic (South Indian), is principally based on melody and rhythm. Raga or Rag or Ragaam is the most essential unit of Indian Music. The Vedic hymns of the Hindu temple are the fundamental source of all Indian music. Thus, the roots of Indian classical music are also religious like western music. Indian music is based on the thought that sound is God- Nada Brahma. Ragas carry us into the spiritual journey. The ancient vedic scriptures teach us about two types of sound. Anahat Nad or unstruck sound and Ahat Nad or struck sound. The Anahat Nad cannot be heard and it is said that only the enlightened yogis could hear it. The Ahat Nad, on the other hand is the vibration of air in the lower atmosphere closer to earth. It is any sound that we hear in nature or is man- made. Indian music uses sounds that sound good to the ear. The very definition of Raga is “Ranjayathi iti Ragah” which literally translates into “That which colors the mind is raga.” A raga presents a specific mood or emotion. Indian classical music expresses every human emotion and subtle feeling in man and nature. Ragas are not Modes nor are they simply scales. Though Indian music is modal in character, ragas should not be mistaken as modes that one hears in the music of the Middle and Far Eastern countries, nor be understood to be a scale, melody per se, a composition, or a key. A raga is a scientific, precise, subtle and aesthetic melodic form with its own peculiar ascending and descending movement consisting of either a full seven note octave, or a series of six or five notes (or a combination of any of these) in a rising or falling structure called the Aaroh and Avaroh. It is the subtle difference in the order of notes, an omission of a dissonant note, an emphasis on a particular note, the slide from one note to another, and the use of microtones together with other subtleties, that demarcate one raga from the other. A raga is the projection of the artist’s inner spirit, a manifestation of his most profound sentiments and sensibilities brought forth through tones and melodies. The musician must breath life into each raga as he unfolds and expands it. As much as 90 percent of Indian music may be improvised and because so very much depends on understanding the spirit and nuances of the art, the relationship between the artist and his guru is the keystone of this ancient tradition. From the beginning, the aspiring musician requires special and individual attention to bring him to the moment of artistic mastery. The unique aura of a raga (one might say its “soul”) is its spiritual quality and manner of expression, and this cannot be learned from any book. It is only after many long and extensive years of “sadhana” (dedicated practice and discipline) under the guidance of one’s guru and guru’s blessings, that the artist is empowered to put “prana” (the breath of life) into a raga. This is accomplished by employing the secrets imparted by one’s teacher such as the use of “shrutis” (microtones other than the 12 semitones in an octave, Indian music using smaller intervals than Western music: 22 within an octave): “gamakas” (special varieties of glissando which connect one note to the other), and “andolan” (a sway – but not a vibrato). The result is that each note pulsates with life and the raga becomes vibrant and incandescent. I will be writing more about Ragas and Indian Classical Music , Stay Tuned ! In my previous post, I described “Raga” the backbone of Indian Classical Music. Today I would like to delve deeper into Notes, Octaves and Scales used in Indian Music. Before we proceed to ragas, let us first examine the most basic notes of Indian Music. The notes used in Indian music are Sa/ Shadaj, Re/ Rishab, Ga/Gandhar, Ma/Madhyam, Pa/Pancham, Dha/Dhaiwat and Ni/Nishad. This corresponds to the western diatonic scale. In Indian music, Sa and Pa (1st and the perfect 5th) have a fixed pitch. The 2nd, 3rd, 4th, 6th and 7th notes are variables. An octave consists of seven notes and is called a “Saptak.” The eight note is double the frequency of the first note and thus is an octave higher. Thus, a ratio of 2:1 frequency yields an octave. 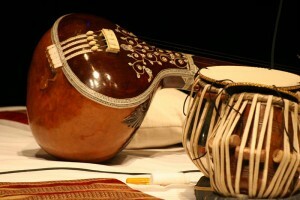 There are three main octaves used in Indian music. The Lower octave / Mandra Saptak, Middle octave/Madhya saptak and Higher octave/ Taar saptak. If the Madhya saptak “Sa” were at 240 Hz, the Mandra saptak “Sa” would be at 120 Hz and Taar saptak “Sa” at 480 Hz. In Indian music system the seven natural notes are derived according to the ratio of 3:2, 4:3, 5:3, 5:4, 9:8 and 15:8 ,which can be also be expressed in terms of ratios as – 1, 9/8, 5/4, 4/3, 3/2, 5/3, 15/8. However, Indian Music uses more than seven notes. Western music uses 12 notes in an octave, whereas Indian music uses 22 microtones called Shrutis, since it was thought that 22 distinguishable notes exist in an octave. However, the 22 shruthis have been approximated to 12 notes by musicologists. Thus we have two microtones for each of re, Re, ga, Ga, ma, Ma, dha, Dha and ni, Ni. The notes starting with lower case are “Komal” or flat notes, except for Ma, where ma is Shudha and Ma is sharp / Teevra. 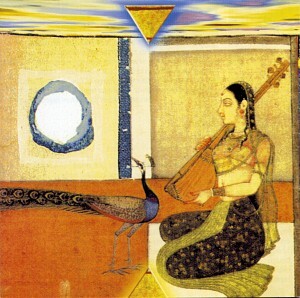 Carnatic Indian Music, which is prevalent in southern India, is different from Hindustani music, mainly in nomenclature. It also has fixed Sa and Pa, 22 shruthis for an octave and 12 notes in an octave, but they are referred to by different names. The Carnatic music scale was defined by Venkatamakhin and has been followed thereafter. The classification of ragas is different from Hindustani music. Western music, on the other hand, has the equal tempered scale, which was created around 19th century. Since there are 12 notes, and the octave is to be divided equally (in a logarithmic sense), each note is obtained by multiplying the previous note by the twelfth root of 2 (which is about 1.059). Thus, the actual frequencies used are slightly different from the pure scale used in Hindustani. The keys of a harmonium, piano, or an electronic keyboard are tuned to this equal tempered scale. Some notes are very close to Indian music notes and some are slightly different. Only very trained ears are able to distinguish the difference. Next up would be a write up on Classifications of Ragas. Raga can be mistaken for modes or scales of western music but it is neither. A raga is a precise, scientific, and aesthetic melodic form with its own peculiar ascending and descending movement. One way of classifying ragas , is by their Jaati. A raga can contain either all seven notes, or six or five. The number of notes used in ascending and descending order specifies the “Jaati” of the raga. All seven notes would be a “Sampoorna” Jaati , while six becomes “Shadav” and five is “ Audav.” There can be any combination of these. For example, a raga can contain a “Sampoorna” ascending and “Shadav” descending. Thus, there are nine Jaatis all together. 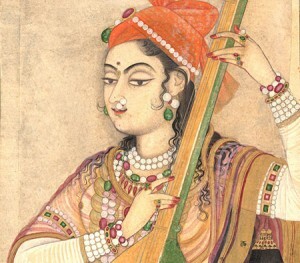 Ragas can be differentiated from one another by subtle difference in the order of notes, an omission of a dissonant note, an emphasis on a particular note, the slide from one note to another, and the use of microtones together with other subtleties. Every raga has a “Pakad” (catch phrase) which is a series of notes used in that raga that brings out the emotion of the raga. The most important note in a raga is called the “Vaadi”(Sonant /king) followed by the “Samvaadi”(Consonant/Queen). Usually the Vaadi and Samvaadi notes are in simple ratio with each other making them rather pleasant as a pair. Therefore, ideally Samvaadi is the fifth of the Vaadi (ratio of 3:2), though a third or a fourth is the note used in most Ragas. Elaborate patterns are thus woven around these notes and also, they can be used as the stop notes in a musical phrase. The dissonant note is called Vivadhi. The Vivadhi is usually omitted in both ascent and descent but sometimes it is just touched upon. The other notes in the scale that agree with Vaadi are called Anuvaadi. Two Ragas with the same notes can have different Vaadi-Samvaadi-Vivaadi making them different and giving them their characteristic flavor. For example raga Bhupali and Deshkar , both have the same ascent and descent, but different Vaadi and Samvaadi , making them different ragas. 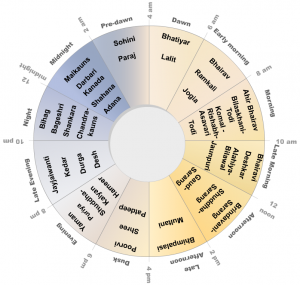 The ragas are associated with a particular time of day. It is said that a raga sounds the best at that particular time. The ragas are classified into “Poorva raga” and “Uttar raga” in accordance with the time they are sung in. Ragas that are sung between noon 12:00 to mid night 12:00 are called “Poorva raga” and ragas that are sung between midnight 12:00 to mid-day 12:00 are called “Uttar raga. ” The ragas that have their Vaadi in the “Poorvaang” or the first tetra chord (sa,re,ga,ma), are Poorva ragas and the ragas that have their Vaadi in the “Uttaraang” or the second tetra chord (Pa, Dha, Ni, Sa)are Uttar ragas. Thus, the Vaadi also determines the time of the ragas. There are some ragas that are bound to a particular season, like, raga Malhaar, Basant etc. Ragas have been classified in various ways. The earliest classification was into Raga (Male) and Raagini , the female counterpart. Then there were ragas derived from these called “Putra” raga (son/children). This classification has been the base of the famous Raagmala paintings. Ragas are also classified by their “Thaats” and we will discuss them next. Ragas can be classified in lot of different ways, some of which I wrote about earlier. Another way of classification is through “Thaats” (framework) in Hindustani music and “Melas” in Carnatic music. Venkatamakhin’s classification of Ragas and its subsequent development has shaped Carnatic Music. Classification of Ragas was based on the scale used by a Raga and thus, Venkatamakhin classified various scales, called Melas. His system not only classified known Ragas but also introduced several new ones, based on the possibilities that the system of classification he used, threw up. All melas are full scales, having seven notes. Every Mela has both Sa, the reference and Pa, the secondary reference. Notes, Re, Ga, Dha and Ni are of 3 varieties each. For a mela, one of the three types of each of the four notes needs to be picked up. This gives us 4x3x3=36 possible combinations. Since Ma can be of two types we get a total of 36×2=72 Melas. Bhatkhande, who came up with a ten Thaat system, classified Hindustani music. These are like the Genera and each Raga classified under it is a species belonging to the Genera. Each of the thaats is named after the most famous Raga using that scale. These ten Thaats of Indian classical music correspond with some Western modes:1.Kafi/Dorian 2.Bharavi/Phrygian 3.Yaman/Lydian 4.Khamaj/Mixolydian 5.Asawari/Aeolian 6.Bilawal/Ionian. The scale above has been written on C scale, but in Indian music the scale of a raga need not start with C, as there is no absolute pitch. The pitch generally depends on the performer. There are several well-known Ragas that do not fit any of these scales, but were subjectively grouped under one of the thaats by Bhatkhande. For this reason, his classification has not been universally accepted by theorists, although it is most widely followed in practice. I still remember that day with overcast bluish-grey sky, sun trying hard to peek out from clouds, cars zooming past ours on multi-lane freeway and a sense of almost child-like wonderment that I had when I first landed at LAX, from India in Dec 2002. I was a newly married bride then and my husband worked and lived here in the USA. This country, its tall skyscrapers, American English, dollar bills, vast freeways, thousands of cars on them, everything was a new experience for me. For the first couple of months, I missed my home country pretty badly but soon after got busy settling down and learning new ways of life. I had to relearn lot of simple things like driving- on the other side of the road, new American words like cab for taxi, eggplant for brinjal etc. I slowly started looking for Indian connection and thanks to Internet I was able to quickly find several sites that provided lists and resources for Indian music schools, yoga classes, Indian restaurants, grocery shops and temples. I used to often think about my childhood days, when little me would hold my mom’s hand and walk across the street to a small gathering place on Thursdays for Kirtans. This was my first introduction to Kirtan singing. The organizer would distribute small pieces of paper to singers such as my mom. It had a particular deity’s name, followed by a number scribbled on them. My mom would look at it and plan what to sing, the number would indicate when it was her turn. Slowly I started singing along with her and then started leading some myself. People would often praise my singing and voice and I made every effort to sing better next time. This also led me into learning Indian Classical music. Looking back, I don’t think I had any idea that music and Kirtan would become my life-long journey. 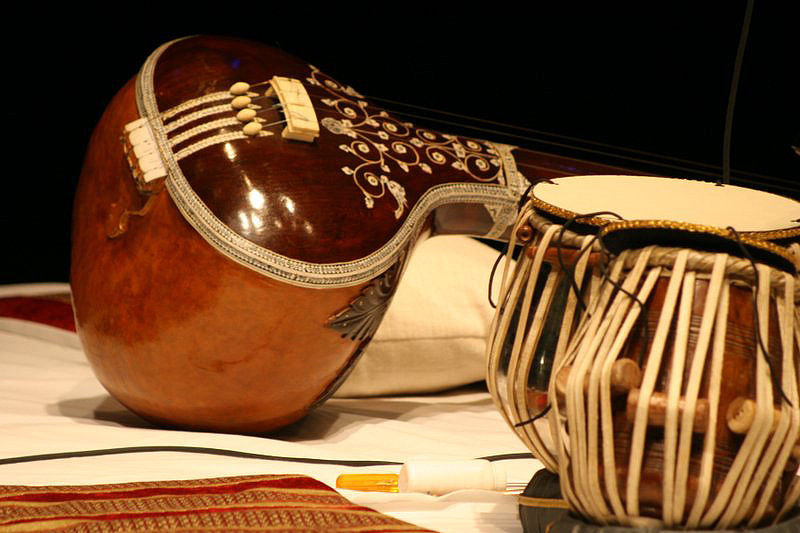 After moving to Los Angeles, Indian classical music was something I missed the most. Back in India, I was part of a large group of devoted musicians, working together to grow as musicians, and serving our community by creating awareness about classical music, a tradition that was fading away and getting replaced pretty rapidly by pop culture of the west. This was the type of work I loved doing- but finding myself in a land where this was no longer relevant made me homesick. Thankfully there were several yoga centers although not as many as there are now. I started going to yoga studios and met several wonderful people along the way- some of whom had been to India and I felt an instant connection with them. One such visit introduced me to the call and response style of Kirtan singing. I was thrilled and excited to listen to non-native Hindi/Sanskrit speakers singing songs about Krishna and Shiva. I liked the music part of it though- so much so that I kept attending Kirtan events. I somehow loved simplicity of Kirtan music with just a Guitar and voice- some basic hand drum. Melodies that were easy to follow and simple rhythms were great for singing call and response style. The focus was on chanting and singing itself rather than on intricacies of melody or odd-meter rhythm patterns. It was not musicianship that was the focus, but chant/mantra itself and more so the intent. The more I started attending these Kirtans with an open mind, the more I received. This was a great learning experience for me as I realized that the very first step towards Kirtan singing is to get rid of judgments and letting go of ego. When you attend a Kirtan next time, try to focus on Bhakti instead of how something is pronounced. In the end, it won’t matter much if someone says “Sheeva” instead of “Shiva.” However, if your focus is fixed on Sheeva you won’t be able to receive benefits from Kirtan. Remember, It is the intent and Bhakti that matters. There is no right way/wrong way, and no, you don’t have to follow the rules of how you sit, whether your eyes are closed or not. Sit in a position that is comfortable to you and your body. If you need to use a chair, by all means do. You do not need to sit in a lotus position if it makes your body uncomfortable because if your body is in pain your focus will shift to pain and discomfort that you experience instead of focusing on Kirtan. You also do not need to worry or think about your singing abilities. Kirtan is not about singing at all. Singing is just a tool, when it comes to Kirtan singing- it acts as a vehicle to transport us into a deeper state of consciousness. It is a journey, in which we travel together with several other people, each with their own destinations, different experiences and different expectations. One thing that is common is that we all want to liberate our minds from our day-to-day stress, constant mind chattering and connect with our divine selves. Kirtan singing and chanting involves Yoga of Sound. Kirtan is an ancient technique that connects us to our inner selves, the Universe and our higher consciousness. It makes you feel more alive, fresh, peaceful and Happy. Like we need physical exercise for good health, we need chanting to nourish our souls, heart and spirit. When we listen to Kirtans or chants for meditation it deepens our Yoga Practice. Chanting and listening to chants for meditation empowers our mental and spiritual processes. It takes us into the deepest state of Yoga. Participating in Kirtans is one of the easiest ways to handle stress in our day-to-day life. To chant is to repeat special vibratory sounds, mantras, or Divine Soul Songs for healing, rejuvenation, purification, and transformation of every aspect of life, including physical, mental, emotional, and spiritual bodies. For thousands of years, singing or chanting has been one of the most powerful spiritual practices for life transformation. Singing or chanting a mantra of a high level spiritual being carries the power of that being. Singing or chanting Divine Soul Songs is divine singing or chanting. It carries divine power. It really is very simple. It may be too simple to believe. Chanting benefits every aspect of life. A human being could have issues in many aspects of life, including physical issues, emotional imbalances, mental imbalances, spiritual blockages, relationship challenges, financial challenges, and more. Chanting can greatly benefit all of these issues because it removes blockages on the level of soul, mind, and body. Soul blockages are bad karma. Mind blockages include negative mind-sets, attitudes, ego, attachments, and more. Body blockages include energy and matter blockages. Kirtan is a spiritual gathering treasure. To chant and sing Kirtan is to gather spiritual fathers and mothers and, especially, the Divine to help transform any issues. Chanting mantras works because they carry soul frequency and vibration with love, forgiveness, compassion, and light. Soul frequency and vibration can transform the frequency and vibration of all life. Love melts all blockages and transforms all life. Forgiveness brings inner joy and inner peace. Compassion boosts energy, stamina, vitality, and immunity. Light heals, prevents sickness, rejuvenates, prolongs life, and transforms relationships and finances, as well as every aspect of life. Chanting Divine Soul Songs works because they carry divine frequency and vibration, with divine love, divine forgiveness, divine compassion, and divine light. Ancient spiritual practitioners often chanted mantras for hours at a time. The longer we sing or chant, the longer divine frequency and vibration are transforming the frequency and vibration of our souls, hearts, minds, and bodies. The more we sing or chant, the more soul mind body blockages are removed. The more we sing or chant, the purer we become. If you want to learn more about Kirtans and how it can help you, consider registering for a Kirtan Workshop.